Donkey Kong was released as part of Nintendo’s early “Arcade Series”, in which they ported their own arcade titles to the NES. Although not a launch title, Donkey Kong was one of the original 30 games that were packaged in black boxes. 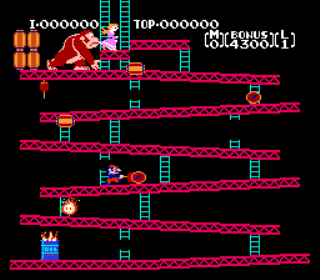 For those who have never played the game, the object of Donkey Kong is to help Mario (“Jumpman” in this, his video game debut) rescue his girlfriend Pauline from his pet gorilla. Jumpman has to scale a partially constructed building while dodging various obstacles to reach Pauline, who is them grabbed by DK and carried higher up the building. Once Jumpman has rescued Pauline at the end of the highest stage, the game starts again with the difficulty incrementally increased. Rather than try to release an arcade perfect home port, Donkey Kong was reworked to make it more suitable to a home console and to take advantage of the NES hardware. The biggest improvement is in the sound. The music and sound effects both sound richer and clearer. and they removed DK’s awful “growling”. To conform to the 4:3 aspect ratio of home televisions, the game has been stretched from its normal 3:4. It doesn’t look bad but it is noticeable if you’re used to playing the original game. The NES release starts out a bit easier than the arcade port, but the difficulty ramps up quickly enough. As is the case with other home releases of Donkey Kong, the conveyor belt level is once again missing. Additionally, the remaining levels are in the wrong order. This really annoys me, as the game is supposed to be bringing the arcade experience home. Even so, this is probably the best port of Donkey Kong on a home console. Unless you are trying to collect a complete set of black label games though, your money is better spent buying the “Donkey Kong Classics” cartridge which includes both this game and Donkey Kong Jr.
Buy Donkey Kong on GameGavel or Amazon. Tagged Arcade, Donkey Kong, NES, Nintendo, Review, Shigeru Miyamoto. Bookmark the permalink.